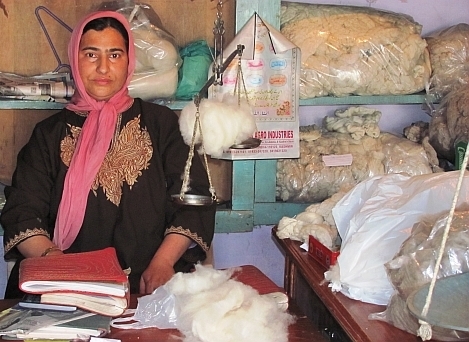 SRINAGAR, India, Apr 23 2012 (IPS) - After scientists in Kashmir successfully cloned the pashmina goat, that produces the famous ‘cashmere’ wool, hopes are running high for the revival of the traditional shawl-making industry in this Indian state. “There is no match anywhere in the world for the handspun, tightly-woven pashmina shawl, although duplicates are steadily being pushed into the market with lower price tags,” says Rafiq Shah, a Srinagar trader. A greater threat to the cashmere wool industry is the dwindling herds of the delicate pashmina goat, which must be carefully reared in the cold and windy Himalayas in order to stimulate growth of the fine wool on its underbelly. But the birth on Mar. 9 of ‘Noori’, a cloned pashmina goat, at Srinagar’s Sher-e-Kashmir University of Agricultural Sciences and Technology (SKUAST) is being seen as just the breakthrough that the ailing cashmere shawl industry has been looking for. At least 15,000 families are associated with the pashmina shawl industry in Kashmir with the women closely involved in the spinning of the wool while the men lend a hand with plying the heavy handlooms. “It (spinning and weaving of pashmina) is in our blood. It even gives us an identity,” says Rather, referring to the fact that the textile ‘cashmere’ borrows its name from the Kashmir region. Cashmere shawl sales bring in about 85 million dollars a year and, along with tourism, represent a major source of income for the seven million people of the Kashmir valley. “Manufacturers in Amritsar and Ludhiana (major woollen goods centres in Punjab state) now import wool from New Zealand and Australia, spin it on machines and treat them with chemicals before passing off second-rate products as pashmina,” says Shah. The making of pashmina shawls, essentially a cottage industry, has long been considered an ideal way for Kashmir’s Muslim women to be gainfully employed without having to step out of their homes. But there are Kashmiri women like Shameema Wani, 42, who have graduated to the marketing of pashmina shawls. She provides work for some 2,000 women, collecting their products for sale at an outlet she set up in the heart of Srinagar about 10 years ago. “This is a job that is suitable for women, because it allows them to attend to household chores and also earn an income,” Wani said while welcoming the scientific developments that promise more raw material for shawl-making. “Noori is the first cloned Pashmina goat in the world and she represents a major breakthrough for us,” said Prof. Riaz Ahmad Shah at SKUAST’s centre of animal biotechnology and head of the World Bank-funded cloning project. Shah and his team at SKUAST used a simple method involving little more than a microscope and petri dish to produce Noori and the method, now standardised, can readily be replicated through the valley. The technology developed at SKUAST can easily be extended to other commercially valuable species in the Himalayas, notably the ‘chiru’ or Tibetan antelope which produces ‘shahtoosh’, a type of wool that is even more highly prized than cashmere. The exceptionally fine fleece of the chiru, which insulates the animal against the harsh climate of the Tibetan plateau and Kashmir’s Ladakh region, has traditionally been woven into shahtoosh shawls, another fine handloom product of the Kashmir valley. However, as at least four chirus must be killed to make a single shawl the animal has had to be placed on the protected list since 1975 by the Convention on International Trade in Endangered Species (CITES). In India, shahtoosh shawls, once a part of bridal trousseaus, fetched around 5,000 dollars a piece until the Indian government banned the trade in 1991. The state government of Jammu and Kashmir, which makes its own laws, delayed banning the trade until 2000 to help artisans. “We are now experimenting with assisted reproduction of the chiru and other commercially valuable animal species such as the musk deer,” Ahmad Khursheed, wildlife management expert at SKUAST, told IPS. According to Khursheed, SKUAST already collaborates with the Laboratory for Conservation of Endangered Species in Hyderabad and the Smithsonian Institute in Washington to conserve several of Kashmir’s endangered species, including the chiru. Kashmir’s traditional shawl makers, particularly female artisans, suffered heavily from the CITES ban on trade in chiru products and there are fears that the art of weaving shatoosh shawls, a preserve of the Kashmir valley, may vanish altogether. “We have undertaken conservation breeding of the chiru and have developed a technique for combing out its wool without killing the animal,” Khursheed said.